Item is the cover page of the fourth edition of Bookbinding, and the Care of Books: A Text-Book for Book-Binders and Librarians by Douglas Cockerell, with drawings by Noel Rooke. Bookbinding, and the Care of Books: A Text-Book for Book-Binders and Librarians. London: Sir Isaac Pitman & Sons, Ltd. Dalhousie Unviersity Libraries Special Collections. 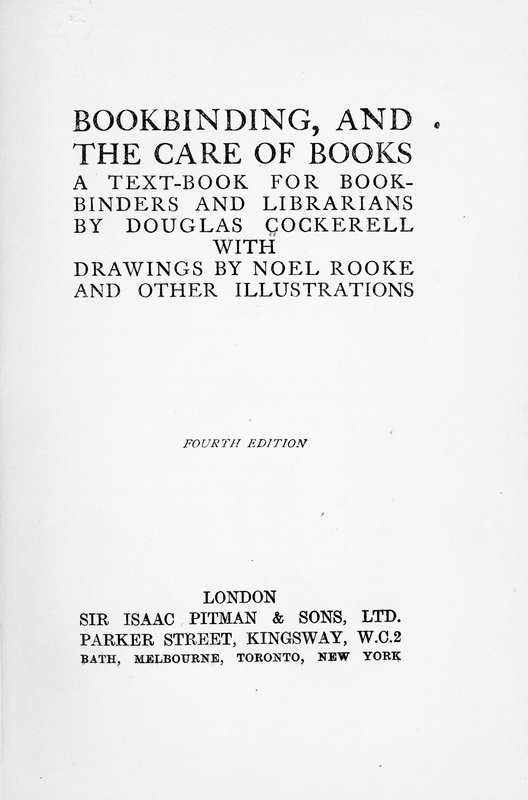 Cockerell, Douglas, “Title page of Bookbinding, and the Care of Books: A Text-Book for Book-Binders and Librarians,” Dalhousie Libraries Digital Exhibits, accessed April 25, 2019, https://digitalexhibits.library.dal.ca/items/show/1045.